TAO is a 20.73m (68') motor yacht built by the UK shipyard Princess Yachts and launched in 2012. Accommodating up to six charter guests over a three-cabin layout, TAO is a great choice for couples, a group of friends or a family. She has a crew of 2 on board to ensure everyone receives a top service, attention and has a relaxing time on board. 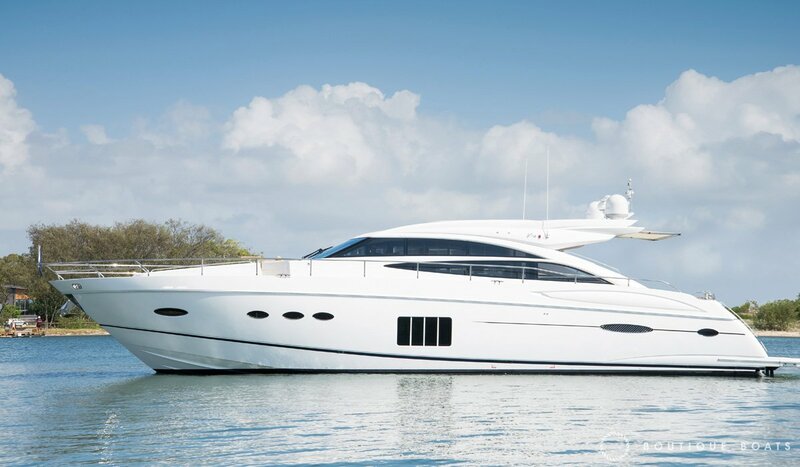 Accommodation is located below decks in the forward section of the yacht and includes one master cabin, one double cabin as well as a twin cabin, all including private bathroom facilities. The galley is also located here. Further fat is the engine room and aft the crew cabin accommodating two members. On deck, the yacht has a lovely dining area next to the helm station, as well as a saloon/seating area amidship. Further aft is a semi enclosed seating area/dining area which opens up onto the exterior with sun pads placed aft. The forward bow section features additional sun pads. Powered by two Caterpillar C18A-1150 diesel engines, she can reach a top speed of 35 knots and has a cruising speed of 28 knots, with a fuel consumption of 400 litres per hour. The yacht’s range is 250 nautical miles and for additional comfort she has been fitted with both at anchor and underway stabilisers. Accommodation comprises three luxury cabins for up to 6 charter guests, all with ensuite bathroom facilities.